The other day Automattic got in touch and told me that Hemingway, one of my three Hemingway Rewritten. That means that the 77 million users on WordPress.com now can install the theme with the press of a button. Hemingway Rewritten is based on Hemingway, but built from the ground up by Automattic with the _s starter theme. 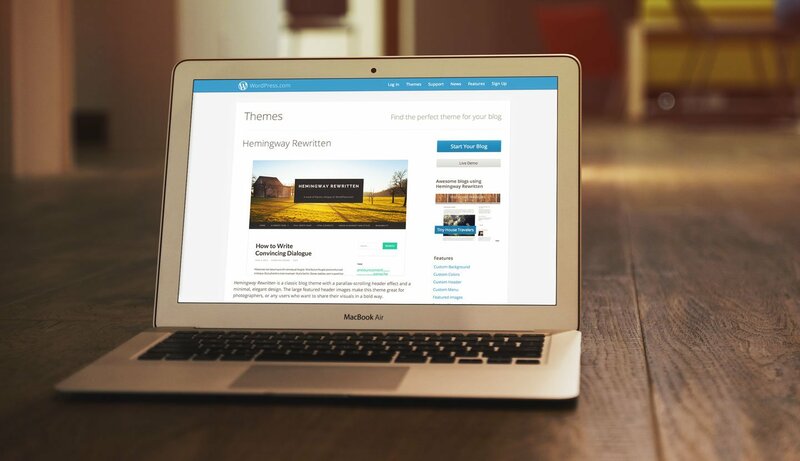 I’m not necessarily a fan of all of the changes (the thin main menu and huge search button grieves me), but it’s incredibly flattering that Hemingway has been selected to be one of 150 free themes in the WordPress.com theme depository. Automattic has written a blog post about the release, and judging from the comments, Hemingway Rewritten seems to be well received by the community. There’s no statistics for theme usage on WordPress.com (at least none that I have access to), but Hemingway has been downloaded about 15,000 times from WordPress.org since the release in February. Wilson has been downloaded a comparatively modest 5,600 times. The popularity of Hemingway has also given Lingonberry, my theme from July last year, a small boost. The statistics on WordPress.org show that the downloads have increased steadily since February. As you probably can tell, I’ve followed these numbers pretty obsessively the last few weeks. To make it a bit easier, I recently added a counter to the theme archives that show the combined number of downloads for all my free themes. The goal right now is the push that number over 50,000. We’ll see if I have to release another theme to reach that milestone.